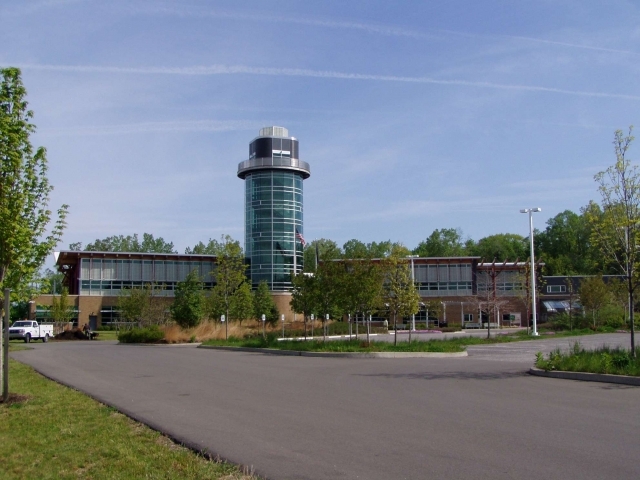 The Regional Science Consortium, located in Erie, Pennsylvania, runs a complex environmental project consisting of three water quality buoys and two terrestrial data monitoring towers. All of these systems were built by NexSens Technology, which continues to maintain and update them. All of the systems log data and send them to the cloud to be hosted on WQData LIVE. The two smaller buoys are located just a short swim off the beach and have been logging data since 2008. They monitor parameters to contribute to the E. coli predictive model to keep the swimming beaches of Erie, PA safe. These parameters include water temperature, water conductivity, pH, turbidity and dissolved oxygen. Both towers have weather stations mounted on top to monitor all the important weather conditions: wind direction and speed, air temperature, humidity, barometric pressure, solar radiation and rainfall. The beach tower is located right on the beach and had to be put up specifically for this project. The data it collects are useful in predicting and reporting weather conditions at the lake to beachgoers. The other tower is part of the Tom Ridge Environmental Center and is farther inland. The weather station is mounted on the roof of this observation tower. The nearshore buoy is the crown jewel of this project. It was built and first deployed in the spring of 2014. The deployment also marked the start of WQData LIVE’s integration into the project. 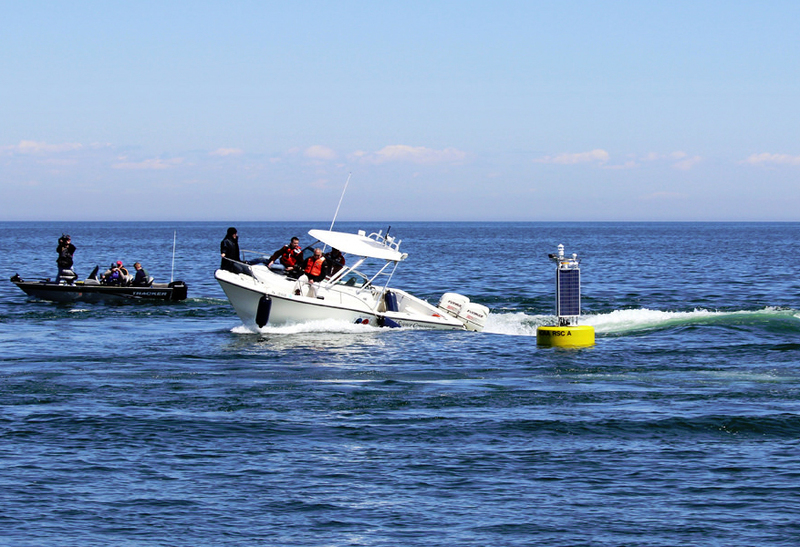 The buoy is a NexSens CB-1250 which houses an iSIC Data Logger, and 3 12V batteries. Beneath the buoy, there is a YSI EXO2 Multi-Parameter Water Quality Sonde to measure water temperature, conductivity, pH, turbidity and dissolved oxygen. There is also a wave sensor that calculates wave height and direction. On top of the buoy is a tower with three solar panels to keep the batteries charged. Mounted atop this tower is a weather station and a camera. The camera records ten-second videos once every hour throughout the day and then uploads them along with the data. Each system in the project sends its data back to a central computer that handles uploading to WQData LIVE. When the data gets to the cloud, they are stored securely in the database and will appear immediately on the website for project members to access. The Regional Science Consortium has also opted to share this data with the public through WQData LIVE’s public portal and through the LIVE Datacenter mobile app. 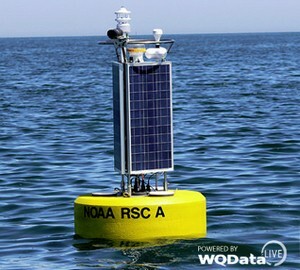 This gives everyone the ability to check on environmental and weather conditions on Lake Erie and the beaches of Erie, PA from any computer or mobile device. The videos that are uploaded from the buoy camera are organized by WQData LIVE and can be streamed straight from the cloud by project members and the public. This project also has a number of alarms and alerts set up to warn project members when conditions are serious or need attention. The cloud system will use the data it is receiving and the parameters set up as alarm conditions to calculate when the alarm needs to be triggered. The server will then send out notifications to any subscribers. Through the LIVE Datacenter mobile app, the public can subscribe to any notifications they are interested in receiving. For this project, these include small craft advisories, storm warnings, gale warnings, water temperature warnings and wave height warnings.